A fun single player, multi level brain game with simple rules, designed for younger children. Can you arrange the beautiful hardwood towers and stairs to create a path for the prince to reach his princess? Choose a challenge, place the pieces as shown and then create a path using only the pieces allowed. With 4 towers, 3 stairways and a bridge to negotiate there are 48 fun challenges from easy to expert and the solution is on the back of each challenge. 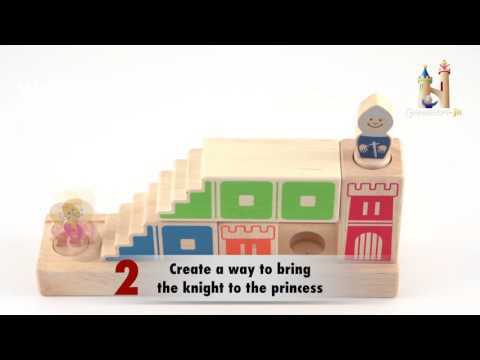 Fun and unusual wooden play set for preschoolers - can the prince save the day? Box Size: 11.6" x 9.5" x 3.5"
Toys for four year old boys are all about fun. They appreciate cool stuff to make and create; the added bonus of gifts like this is that it keeps them out of mischief. Making stuff, dinosaurs, and outer space are very popular with this age group, along with toolkits and balls to kick into next door’s garden.